Home › Investing › What Is A Betterment Tax Coordinated Portfolio? What Is A Betterment Tax Coordinated Portfolio? An extra 0.50% gain in portfolio value each year might not sound like much cause for celebration in the short term but over 30 years it can amount to a 15% increase. The Betterment tax-coordinated portfolio cannot guarantee this positive outperformance but rigorous mathematical studies show historical outperformance using this strategy. But what is a Betterment tax coordinated portfolio? A Betterment tax coordinated portfolio automates the strategy of asset allocation and optimizes it by placing assets that will be highly taxed into qualified retirement accounts that have tax breaks, and placing lower-taxed assets into taxable accounts. To better understand the value of a Betterment tax coordinated portfolio, look first to the world of human advisors. 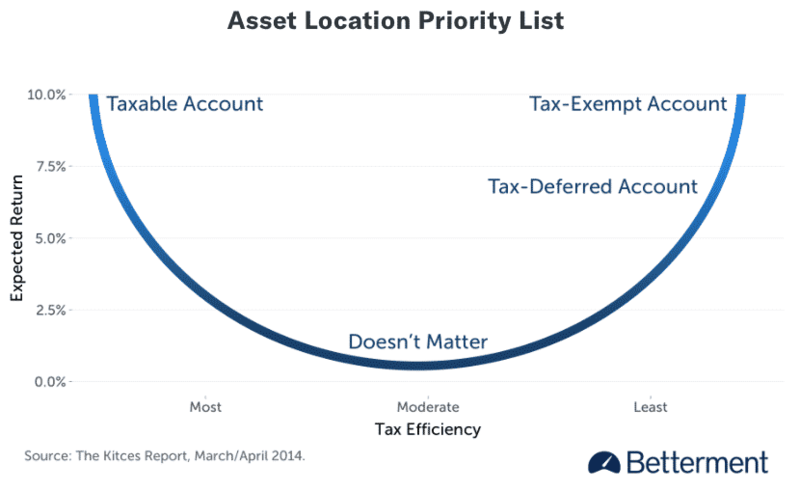 How Does A Betterment Tax Coordinated Portfolio Work? Is A Tax Coordinated Portfolio The Same As Tax Loss Harvesting? To understand the value of an automated tax coordinated strategy, consider the “old world” paradigm where traditional financial advisors manage the portfolios of say 100 clients. Let’s assume the human financial advisor wants to do a good job for clients, so portfolios are tailored to their unique financial circumstances. The advisor diligently builds portfolios for each client accounting for age, risk, time horizon and so on. Now fast forward a year or two, and more often than not, many of the portfolios will experience portfolio drift, whereby some assets make up a disproportionately large portion of the portfolio. Many of the portfolios will not be optimized for tax-efficiency either. And it’s no wonder why. After all, the human advisor with 100 clients may only have 2-3 working days per year to build, optimize, adjust, and monitor any single client portfolio. A client paying a financial advisor $10,000 per year in fees assumes that those fees cover a year’s worth of work. And theoretically they do. But in practice, through no fault of the financial advisor necessarily, it is difficult to spend much more than a few days on any single client portfolio. Some clients may pay as much as $5,000 or more per day to their financial advisor without knowing it. Human advisors are limited by their own time constraints in serving clients as well as they might wish. And because only so many clients can be served, fees charged to clients are higher in order to make the financial advisory businesses viable. These problems are solved by roboadvisors, such as Betterment, who automatically monitor, rebalance and optimize portfolios regularly. By leveraging technology, roboadvisors can serve thousands of clients where human advisors are limited to serving perhaps only 150 clients. So, Betterment may have technology advantages over human financial advisors but how do its tax coordinated portfolios actually work? The way a Betterment tax coordinated portfolio works is that the most tax-efficient assets are placed in accounts taxed least favorably and the least tax-efficient assets are placed in accounts taxed most favorably. What Betterment has figured out how to do is to dynamically allocate assets across accounts to optimize for tax efficiency, aligned with a client’s risk and reward objectives, and maintain a globally diversified portfolio. 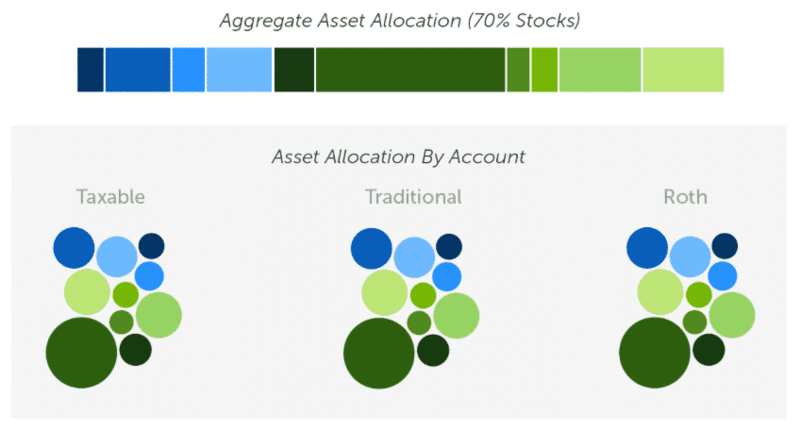 For investors who don’t have the time, ability or desire to figure out how to create an overall asset allocation strategy, the automated solution from Betterment makes a bunch of sense, especially when considering that the probability is low that a human advisor without Betterment’s technology and scale advantages can replicate similar portfolio performance. Betterment estimates that the annualized benefit from tax coordinated portfolios ranges from 0.10% to 0.82% with a typical customer who has taxable, tax-deferred and tax-exempt accounts enjoying an annualized 0.48% portfolio value increase. Tax loss harvesting is compatible with a tax coordinated portfolio, but they are not the same thing. Tax loss harvesting is an automated algorithm that Betterment applies to taxable accounts in order to offset taxable gains with taxable losses to maximize after-tax returns. Imagine you have a taxable portfolio worth $250,000. As time goes by, like any portfolio, some positions will be winners and some will be losers. Let’s assume that tax deductible losses of $25,000 have been harvested over a period of time. This $25,000 tax deduction could potentially translate into savings of say $7,500 in income taxes. Now, let’s say you earn an average 7% annually on your portfolio. The $7,500 you could invest earns $525 per year on average. But your fees on the $250,000 portfolio are $625, assuming a 0.25% management fee charge. So, the earnings from tax loss harvesting have the potential to offset a good portion of your management fees. As more time goes by and more tax losses accumulate, more income tax savings amounts can be invested to ultimately eclipse what you pay in fees. It is intuitive to think that the best way to allocate assets across multiple accounts is to apply the same division of assets to each portfolio. Imagine a taxable portfolio made up of 70% stocks and 30% bonds for example. You might think that your taxable brokerage account as well as your tax-efficient retirement accounts should all have the same division of assets. But the mix of assets selected for any given portfolio should not be mirrored in every account. Instead, the goal is to maximize the after-tax returns of the aggregate portfolio. For example, placing municipal bonds that have tax advantages into a taxable account makes a lot of sense. But placing them in a 401(k) or IRA makes little sense, because both of these accounts already enjoy a tax-advantaged status so the tax breaks on municipals bonds are not adding a tax benefit. The way Betterment explains this with these intuitive visual graphics below. 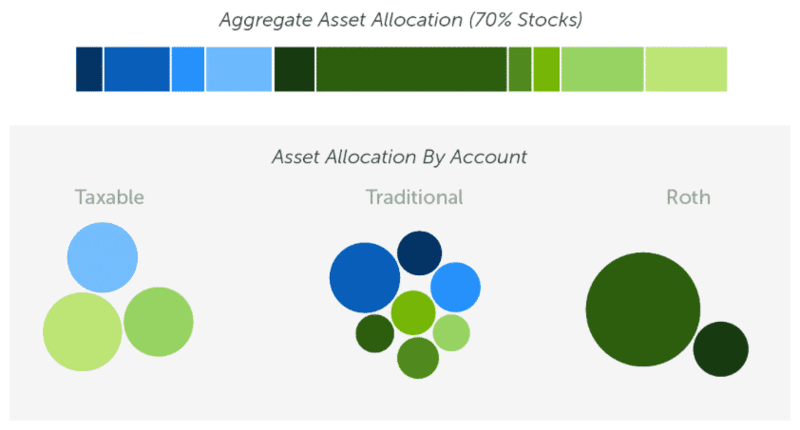 The first infographic highlights a portfolio with accounts managed separately – without asset allocation. This second infographic highlights the same overall portfolio with asset allocation. Investing in the stock market is mired with pitfalls. Many investors who beat the market for a few years or even a few decades experience a demise when the holes in their strategies are revealed. Even Nobel-prize winners who thought they found the holy grail investing strategy experienced doom. Roger Lowenstein documents this journey in his famous book When Genius Failed: The Rise and Fall Of Long Term Capital Management. For these reasons, casual investors generally fare better by investing in index funds that form part of a diversified portfolio. Asset allocation takes the concept a step further by executing investment strategies in a more tax-efficient way. Asset allocation is sometimes called the only “free lunch” in investing because it can maximize long-term, after-tax returns without increasing risk. To convey the benefits of this “free lunch” on a continual basis to clients, Betterment relied on software engineers, tax experts, quantitative analysts and product engineers to build algorithms to monitor and adjust portfolios daily. Casual investors often focus on pre-tax returns but smart investors know the real key to long term performance is to maximize after-tax returns. To do so requires minimizing the cost of tax drag. Tax drag is the part of an investment return which is lost due to tax payments each year. A way to reduce tax drag is to put assets that pay dividends into a tax-deferred account, such as an IRA, as opposed to a taxable account. Choosing tax efficient assets, which produce most of their returns through gains as opposed to dividends, also minimizes the effect of tax drag. But tax efficient assets don’t always help you from a tax perspective when it comes time to sell your assets. Sometimes it is best to choose an asset that is less tax-efficient but has a higher expected return than an asset that is more tax-efficient but has a lower expected return. If you are starting to think this is a lot of work, it is a good reason to seriously consider a Betterment Tax Coordinated Portfolio. It’s no mean feat trying to puzzle through this alone, especially by hand. To help you think visually about the process of optimizing for after-tax returns, and allocating optimally, Betterment provides the following infographic. The complexity of building a tax coordinated portfolio is so great that simple rules of thumb, while helpful, are inadequate in maximizing long-term returns. If you don’t have the time or desire to roll up your sleeves and break out the spreadsheet to perform some quantitative analysis, Betterment’s tax coordinated portfolio offers a compelling long-term solution. Betterment does the work for you automatically so you get to enjoy a hands-off investing experience, which has the added benefit of not succumbing to the temptations to beat the market, an endeavor in which few have succeeded over time. ‹ How Much Should Be In My 401(k)?